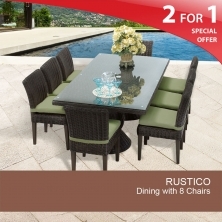 Enjoy great food with our Rustico outdoor dining furniture sets. Whether you’re having brunch with friends or a romantic sunset dinner, Design Furnishings’ durable and classic wicker dining sets are sure to be the perfect addition to your unique outdoor space. 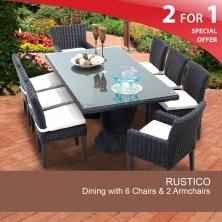 And remember, with our buy more, save more guarantee, now’s the perfect time to complete your outdoor seating with a matching wicker patio dining set. 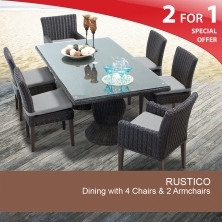 Browse all-weather wicker outdoor furniture for sale today! 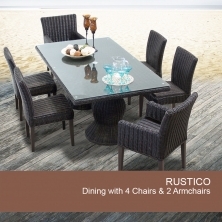 At Design Furnishings, we offer classic, contemporary, and unique outdoor dining sets with the most current color and fabric trends to match the theme of your outdoor space. Choose from classic pedestal and double pedestal dining tables, as well as rectangular and square option, each surrounded by comfortable high-back chairs finished with thick-welted cushions in six fashionable colors. 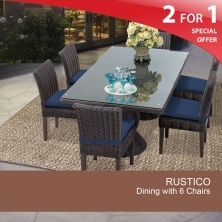 Our wicker dining sets are built to last in all weather conditions. 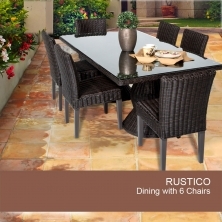 All of our Rustico outdoor dining furniture sets are made with premium, hand woven, commercial-grade resin wicker. This UV-protected wicker won't splinter, rot, crack, chip or fade in extreme temperatures. Hand constructed to the highest standards, our premium wicker and aircraft quality, sturdy aluminum all-weather outdoor furniture will withstand the coldest of winters, hottest of summers and even the harsh salty air of coastal regions. 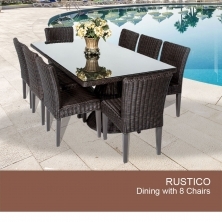 All of the Design Furnishings wicker dining sets feature seats that are designed using comfortable, 6-inch, high-density foam cushions that are surrounded by UV-protected, fade-resistant, washable fabrics. Choose from a palette of fresh and fashionable colors to suit your sense of style and rest assured knowing that all of our fabrics come with a two-year fade warranty. 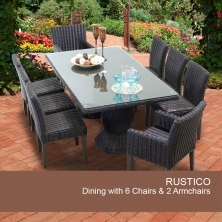 Browse our Rustico outdoor dining furniture sets today!